WELCOME to Queensland Election 2017 for Mackay, Mirani, Burdekin and the Whitsunday, a region home to three of the state's most marginal seats. We will have rolling updates throughout the coming days as the votes are counted to determine who will lead the state and our electorates for the next three years. Burdekin continues to be the seat to watch. The Electoral Commission Queensland is counting up the results for the 93 state electorates, working through more than 2.6 million votes. 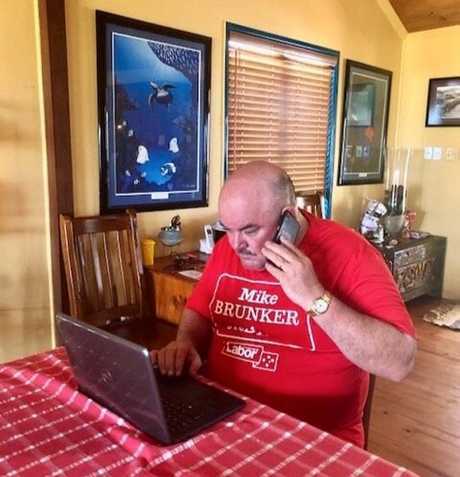 The saying 'the suspense is killing us' has rung true for Labor candidate Mike Brunker's camp in the count for one of Queensland's most marginal seats. With preferences from One Nation's Sam Cox deciding the two-party preferred outcome, Mr Brunker is currently 151 votes behind Mr Last. "I am now awaiting the outcome of the postal votes," Mr Brunker said. "It's been a nervous wait but I'm glad I went in with that primary lead. BURDEKIN: Sitting LNP member for Burdekin Dale Last has increased his lead on ALP's Mike Brunker this morning as a stack of postal vote results have come in. As one of the closest seats to call in Queensland remains unknown, as at 12.20pm Last is leading with 12,705 total votes with Brunker trailing by 372 votes - at 12,333. "Words can't describe how I'm feeling right now. It is such a rollercoaster ride," Mr Last told the Mercury yesterday afternoon. "Votes come in, you're up, you're down, it's an emotional rollercoaster." His comments come as the frontrunner for Burdekin changed multiple times throughout the day Monday, as Labor candidate Mike Brunker started the day off strong. The latest results come after just 34 votes separated Last and Brunker at close of count Monday afternoon. Last said the message from his party was to keep spirits up. "I'm just hoping for the best." The Collinsville pre-poll votes are yet to be counted, in which Brunker is expected to claw back some of the votes. 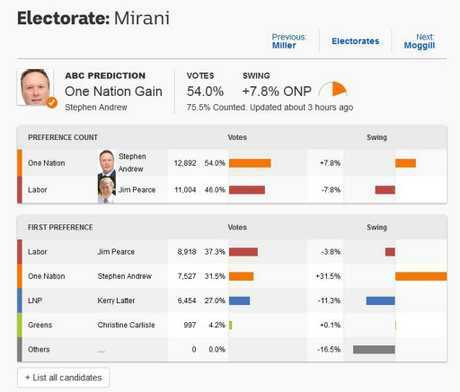 MIRANI will no longer be in the hands of Labor as the seat looks certain to fall to One Nation's Stephen Andrew. At this stage of counting, Mirani is the only seat won by Pauline Hanson's party, even as One Nation won an average swing of 20% across electorates where it had candidates. As of 7pm on Monday, 75.5% of the vote had been counted and One Nation was ahead 54% to 46% on preferences. That is despite Labor's Jim Pearce scoring almost 1400 more first preference votes than Mr Andrew. It was enough for ABC election analyst Antony Green to call the seat for One Nation. The result will come as little shock to the Mr Andrew candidate who on Sunday afternoon said the result looked "very promising" for a One Nation win. 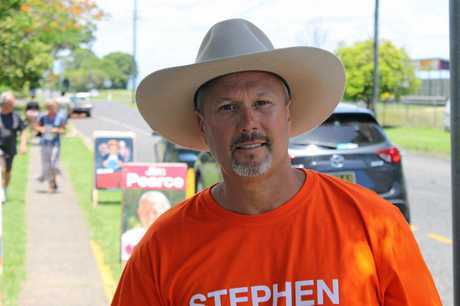 Mr Pearce faced an uphill battle in the seat, after the seat lost a large part of its traditionally Labor-voting townships including Coppabella, Dysart, Glenden, Middlemount and Nebo. On Saturday night, the former miner conceded that he would be unlikely to win enough on preferences to beat the One Nation candidate. SAM Cox's preferences will decide the outcome of the seat, the LNP's Dale Last has said this morning. It's unlikely the result will be known today (Monday) as preference counting is expected to continue until lunchtime tomorrow. It's also one of the state's biggest electorates, taking in parts of the Great Barrier Reef as well as mining towns out to Clermont and surrounds. It continues to be a three-horse race between Mr Last, One Nation's Sam Cox and ALP's Mike Brunker. But Mr Cox is trailing in third which means his preferences come into play. "Across the state (One Nation preferences) tend to be flowing more to the LNP candidate than to Labor - to what extent for Burdekin we won't know until later," Mr Last said Monday morning. "Over Queensland some seats were as high as 75 per cent (to the LNP) and if we see those sorts of figures it should be good for me." Front-runner and ALP candidate Mike Brunker said yesterday, preferences would be split between the mining and farming votes. "I expect the mining communities to go my way and the cane farmers to go to Dale," he said. The Collinsville pre-poll is expected to be counted at 2pm. MORANBAH pre-poll has been counted and it has extended ALP candidate Mike Brunker's lead in the three-way fight for the Burdekin. Mr Brunker won 60 per cent of the 2052 pre-poll votes ahead of 21 per cent to One Nation's Sam Cox and 16 per cent to LNP member Dale Last. Mr Brunker now sits 1100 votes clear of Mr Last as the battle for second tightens with Mr Cox needing just 400 votes to take that position. There is still the Collinsville, Clermont and Middlemount pre-poll booths to be counted and Mr Brunker is expected to win the majority of votes from two of those three. STATE Labor has been issued a challenge from a senior party MP - the next three years need to be about re-engaging with regional Queensland. Asked about jobs in the regions, Labor Senator Anthony Chisholm said the short answer was "there'll never be enough jobs in the regions". "I think one of the concerns is that for the first time in a long time, people of working age leave a town like Mackay," he told an election panel Saturday night. "Which has traditionally been a strong economy that has a track record for attracting people to it; people are seeing that there are opportunities elsewhere. "And that is a concern for me, because if you want a government for whole of Queensland you need to ensure that people in those regional towns understand that they have a bright future - so I see that as an opportunity for the Labor party and one that we need to get right before the next federal election comes around." Read the full wrap up of the weekend here. BRONWYN Taha is not conceding defeat for the seat of Whitsunday despite LNP MP Jason Costigan maintaining his narrow lead. Ms Taha spoke to the Labor Party faithful at the Altmann Avenue VMR Building last night and said there were still some big booths to come in. "I've been through this before, I'm feeling fine but no matter what happens we can all say we put everything into this," she said. "I've been doing this since the last election and have been talking to as many people as possible. We did not leave any stone unturned." The One Nation candidate for Mirani Stephen Andrew has not claimed victory yet but has said the outcome is looking "very promising". Mr Andrew is currently sitting in second place behind ALP member Jim Pearce in the seat but is expected to pick up preferences from the LNP. The Mackay man has so far chosen not to speak with media today instead spending time with his family. A statement released by One Nation said it had been a strenuous four-week campaign where (his family) didn't see him for much of the time. "The ECQ have indicated it will be another 3 to 4 days until the seat is declared, so until preferences are dispersed and counted thoroughly, I'm not quite prepared to claim victory," the statement read. "The outcome is looking very promising though." ALL eyes turn to Mirani Sunday morning as the seat that could give One Nation its only MP out of the Queensland election. Stephen Andrew could take the seat in a shock win for the minor party. It would add further interest to the history of the seat of Mirani which has historically been a safe conservative; held by the Country Party, then the National Party and Liberal National Party from 1947 to 2015. It was a redistribution in 2008 that gave Mirani to Labor with a 1.2% margin, but veteran incumbent Ted Malone achieved a swing strong enough to retain it at the 2009 election. Malone retired in 2015, and Mirani was won by Labor's Jim Pearce. But, with the 2017 boundary redistribution, Mirani lost a large part of its Labor voter base including Coppabella, Dysart, Glenden, Middlemount and Nebo, which went to the Burdekin. Mr Pearce admitted last night he would not get enough preferences to beat Mr Andrew, who has so far stayed quiet about the count and possibility of finding himself in Parliament. Meanwhile Latter is still holding out hope his election campaign could be saved by postal votes. Mr Latter is 2000 votes behind ALP member Jim Pearce and almost 1000 behind One Nation candidate Stephen Andrew. One Nation is expected to win the seat on preferences as Mr Latter asked his supporters to vote for Stephen Andrew after him on their ballot paper. But, if Latter can bridge the gap and overtake Mr Andrew from either pre-poll and postal votes he would pick up preferences from One Nation. Interestingly, Latter, who was Canegrowers Mackay chief executive officer before running in the election, polled poorly in sugar cane areas. He received fewer primary votes than Mr Pearce at Gargett, Koumala, Marian, Mirani, Sarina and Eton. While Andrew received a smaller percentage at those booths, those conservative votes would have been vital for Latter's campaign. Latter said many One Nation voters didn't know who they were voting for. "I think a lot of people were actually voting for Pauline, I had a number of people who were strong in their mind voting for Pauline would make her the next Premier of Queensland," he said. "A lot of people are hurting and I think people have clutched to (One Nation) as something that will make change." In a twist in the seat of Burdekin, ALP candidate Mike Brunker has taken the lead, as counting gets underway again Sunday morning. Mr Brunker went to bed within 200 votes of LNP member Dale Last and One Nation candidate Sam Cox. But after the Bowen pre-poll booth votes were counted, Brunker has regained the lead with 7659 votes, ahead of Mr Last with 7401 and Sam Cox on 6908. The pre-poll booths for Clermont, Collinsville, Middlemount and Moranbah are expected to arrive in Ayr for counting about 5pm Sunday. 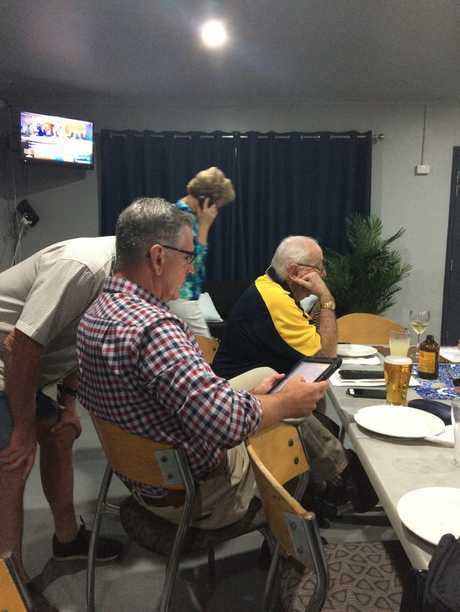 ALP candidate for Burdekin Mike Brunker watches the state election results from his Bowen home on Sunday. Mr Brunker said given his resounding success yesterday at all of these booths except Clermont, he was hopeful of a good result. "I won the primary vote on the day so the pre-polls should be similar," he said. "The trend won't change and the further we get out west the better it is for me." But he acknowledged preferences would determine the final result. "One Nation miners will probably have preferenced me and the graziers are likely to have preferenced Dale," he said. "That's why it will go down to the wire." GEORGE Christensen has taken to social media to apologise to conservative voters in Queensland and promised to work harder after the Liberal National Party fell short in the state election. In a tweet Sunday morning, Mr Christensen said the LNP needed to stand up for more conservative values and regional Queensland and do better to win voters' trust. "A lot of that rests with the Turnbull Government, it's leadership and policy," he said. His statement comes as conservative voters shared their first preferences in all of the Queensland seats within Mr Christensen's Dawson electorate. In Mackay, LNP candidate Nicole Batzloff won 6697 votes and One Nation's Jeff Keioskie 6191. The ALP's Julieanne Gilbert won the seat with 11,752. The Burdekin is still undecided as LNP member Dale Last leads on 6675, from PHON's Sam Cox 6396 and the ALP's Mike Brunker on 6140. Standing by for the count to start this morning. HE HAS been a champion of the union movement, won an almost impossible seat but now faces defeat. But ALP member for Mirani Jim Pearce has gone down swinging. And while the seat of Mirani hasn't officially gone to One Nation - Mr Pearce told The Daily Mercury overnight he would not get enough preferences to beat One Nation candidate Stephen Andrew. On live TV he took Queensland senator Matt Canavan to task for not imposing tougher rules on mining companies to stop the casualisation of the workforce, and dropped the word 'bullsh--' on national TV. This resonated with the audience who went to Twitter to praise the former miner. Mr Andrew said it was hard to tell from the voter feedback at the booths which way the seat would go. One of the largest electorates in Queensland, it stretches from Mackay to Parkhurst and around Rockhampton to areas near Gladstone. Mr Andrew said there was no animosity between him and Mr Pearce or Mr Latter who had caught up with each other on the hustings today. "I've done what I can," he said. "If it's the people's will that I get in, that's where I'll be." Meanwhile, Julieanne Gilbert and the Labor party have successfully retained the seat of Mackay. KERRY Latter's preferences could prove the decider in the seat of Mirani, and it could mean a shock win for One Nation and candidate Stephen Andrew. Mr Latter's LNP how to vote cards preferenced One Nation second, ahead of Labor and The Greens which means if the current trend continues, Latters' votes would go to Andrew. Andrew is currently polling above Latter with 5615 votes (31.76 per cent). Latter has 4715 votes (26.67 per cent) in Mirani, while sitting Labor member Jim Pearce has attracted 6578 votes (37.21 per cent). The Electoral Commission Queensland has just cleared the two-party preferred candidates for Mirani, and is expected to replace Kerry Latter with Stephen Andrew. BECAUSE One Nation candidate Sam Cox went against his how-to-vote cards and instead told voters to "preference however you like", LNP candidate Dale Last is confident he'll win the extremely close race of Burdekin. 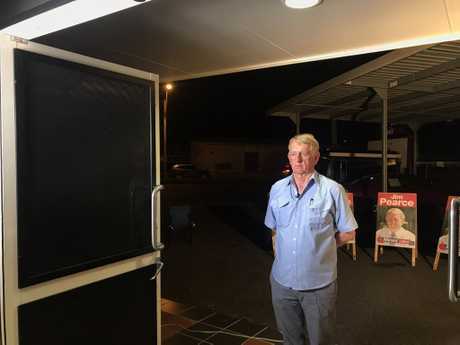 "I was standing beside him all day today basically, and he was telling all the voters to vote one for him and then make up their own minds in regards to preferences, which is very interesting," Last said from his supporters' party at the Burdekin Hotel in Ayr. "(One Nation) have told all the voters not to follow their how-to-vote card. "So that's interesting. So certainly, particularly around the Burdekin area, I expect the One Nation preferences to flow to me, so we'll wait and see how that plays out in coming days." Earlier, watching the results flick between himself and ALP candidate Mike Brunker leading the tally, he said: "this is doing my head in". "We always knew this was going to be very close in this seat," Last said. "The results so far tonight certainly support just how close this is going to be, so we're just watching the broadcast at the moment and they have this seat as LNP but too close to call. "We know there are thousands of pre-poll votes to count so over the coming days they will determine the results in this seat." He was happy to call a few main booths early, though, with East Ayr State School and the Burdekin PCYC showing Last as winning early. "I'm happy about that; they're big seats," Last said. "I've picked up some votes in Moranbah, which we always knew was going to be tough country for me. Mike Brunker at this stage is polling fairly well in Bowen which is his own town so you would expect that as well. "Very keen to see Clermont as well, that traditionally has been a strong nationals area, so I'm hoping those results come in and they'll fall my way." Last said it was still "really close", coming down to pre-poll results likely into next week. "We know there was nearly 5000 in Ayr alone, 2000 in Bowen, 1300 I'm told in Moranbah, over 1000 in Clermont," he said. "So there's a lot of votes still to be counted in coming days, so we'll wait and see." Lending her support to Last's vote tally party - and campaign - was Rosemary Menkens, who retired before the 2015 state election and endorsed Last to replace her. For her, she was "most concerned" about what had happened to the Burdekin electorate in the redistribution of boundaries. "It's been redistributed very much in Labor's favour," Mrs Menkens said. "I'm very disturbed how it went, because they've put the mining communities together which is excellent but they've brought them back to the coast to relate to the communities of Ayr and Home Hill and taken Townsville. "I've been out in Moranbah over the last week, and they are delighted to be going back to the coast - but if it was about taking the communities back to the coast it should have been taken back to Mackay." "These people go to Mackay, they rely on Mackay." Mrs Menkens said whoever gets elected in the Burdekin electorate would have "an extremely difficult task" to service the huge electorate. "That's the bottom line; it's not about who wins, it's about the people." What makes someone volunteer for an election?